Tourism Northern Ontario (TNO) has made major strides in shifting from the creation of product development strategies into the implementation stages with the nine “best bet” products and experiences that include: angling, snowmobiling, nature and adventure, auto and RV touring, cycling, culture & heritage – Group of Seven, international, wayfinding and gateways and communities. With emphasis put on implementation of these sector strategies, TNO has dedicated a full-time Senior Product Development coordinator, Nicki Schiewe, to work with the designated product teams. Nicki has guided the development and framework around the strategies to bring the experience to the next level of market readiness. Partnering with Manitoulin Island Cycling Advocates to undertake a future wayfinding/signage project. Hosting an upcoming Tourism Excellence North cycling specific Best Practice Mission in the late Fall of 2018. Stay tuned for more details. Working with Ontario by Bike to promote the new cycling products in the North. Partnering with Tourism Sault Ste. Marie on developing a new signature mountain bike event. TNO caught up with one of our dedicated cycling product team members, Maja Mielonen, to discuss cycling product development in Northern Ontario. What is your involvement with cycling in Northern Ontario? As President of the Manitoulin Island Cycling Advocates (MICA), we have put forth many cycling initiatives and efforts to develop cycling on Manitoulin Island, including: lobbying for paved shoulders, creating and selling the highly popular Manitoulin Island Cycling Route and Road Map, participating in an advisory committee role for Ontario By Bike and on the product development team for Tourism Northern Ontario, partnering on various community projects, offering an all-inclusive cycling vacation package on Manitoulin Island, hosting the annual Manitoulin Passage ride celebrated each June, and just this year we are undertaking a partnership with TNO for a large trailhead initiative. What are some challenges that cycling is facing in Northern Ontario? Cycling rental facilities are missing all together and cycle mechanics are too few in the North. As part of the Great Lakes Waterfront trail, the Georgian Bay Cycling Route is still missing the important Ministry of Transportation Ontario commitment to solve the two missing links – south and north of Killarney to connect the south to the north alongside Hwy 400/Hwy 69 corridor. What are the three exciting things everyone should know about cycling in Northern Ontario? Sparkling sky and waters await you everywhere and the back roads are quiet and pastoral. The people friendly and helpful. Manitoulin offers over 800km of cycling loops. The annual Manitoulin Passage Ride offers free ferry passage to Manitoulin where you will enjoy a two-day fully supported ride. We pair fun rides with camaraderie, friendship, good food and music, creating long-time memories. It should be on every cyclist’s bucket list. 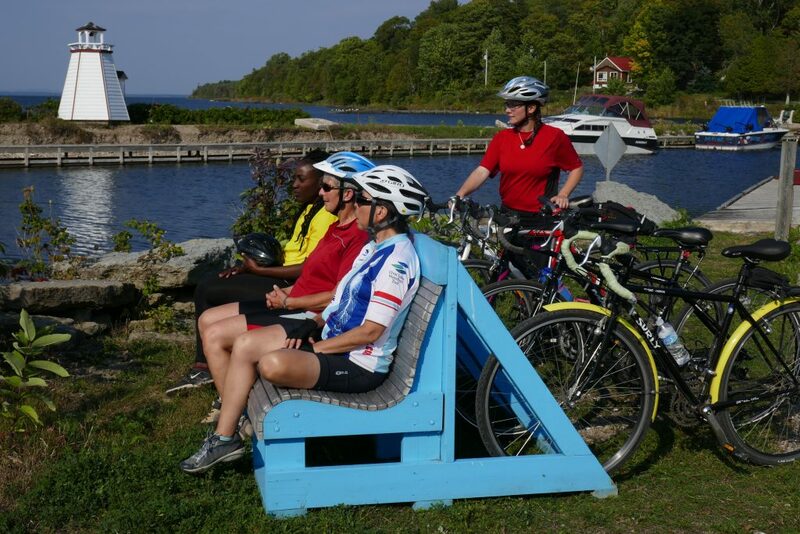 Manitoulin also hosts the first Northern Ontario all inclusive cycle tour adventures, a 5-day riding 4 -nights stay at waterfront lodges and cottages. Where do you see cycling tourism in Northern Ontario in 5-10 years? Family vacations will increasingly include cycling as part of the activities on their holidays. Advertisement will increasingly attract the Canadian cycling market. Ontario with TNO will advertise Ontario as a whole and Northern Ontario as a special destination to the USA and European touring vacation industry (e.g. cycling around Lake Huron, cycling around Georgian Bay). Sault Ste. Marie and areas to the North, will have established, wonderful mountain bike areas, adding additional activities to the many other holiday attractions found in the North.